Imagine having something super irritating lodge in your ear and not be able to get it out. I watched this young coyote work on it for 20 minutes. I could feel when the distress got excruciating: the coyote ran towards bushes to dislodge whatever was in there, he ran towards another coyote to ask for help but didn’t get any response, he shook, he scratched, he galloped about, rubbed on bushes, he moped forlornly with his ears down, he tilted is head in all directions. He ultimately resorted to eating grass which coyotes do when they have an upset stomach — of course this didn’t work. I was not able to see that he solved the problem. I really felt for the little guy. We humans have our own worries, so we forget that even wild creatures, too, have many seemingly mundane things to cope with. I’ve seen thorns in foot pads, eye infections, ears infestated with mites, limping, skin ailments, wounds, etc. These things occur regularly in our wildlife. This series of photos, over a long twenty minute period, show how distressing it can be for animals to deal with these seemingly petty annoyances. Previous San Francisco Forest Alliance: Preserving Our Urban Forests & Wildlife Habitat Next Spectacular Ordinary Sand! Just wanted to tell our story of an encounter with a coyote and our dogs [2 schnauzers]. We were out today for a walk along the creek bed in Edmonton Alberta, and had walked about 1 hr on the frozen creek in a ravine. On the way back our two dogs were suddenly focused on something and then ran off ahead of us about 20 yards. I was watching them run my husband said what is that? i said what? and saw something on the ice and then realized it was a coyote who was lying down and by the time the dogs got to it [by this time i was scared and had visions of one or both of them being attacked or running after it and being attacked in the bush by others] had gotten up and the dogs were right behind it….I pulled off my gloves and whistled to the dogs and thankfully they ran back to us.. and the coyote ran up the bank slinking with its tail down…. not sure if we surprised it or if it was trying to lure the dogs back into the bush up over the bank of the creek. Anyway, it made me realize the importance of a leash! Yes, it was submissive behavior on the coyote’s part when the dogs ran right up to it….so I was wondering if it was just sunning itself or it was a calculated move as they are very in tune with their natural environment and we were walking on snow covered ice which is not that quiet. We have seen lots in the wild/city here as we have a large river valley and numerous ravines that run right thru our city, so nature is in our back yard! Hi Janet and Catherine. I believe the coyote was also reacting to human presence. 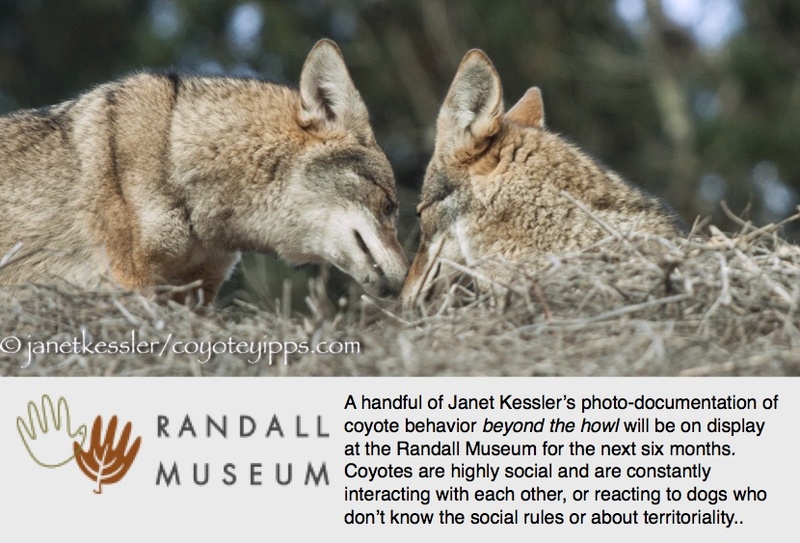 From the coyote’s point of view, a group of four approached it. 20 yards is pretty close. For a coyote 20 yards or so is well inside its discomfort zone. A hundred yards would have been a more comfortable distance for the coyote. Its body language in leaving indicated to the group that it didn’t want trouble.The dogs may have been in front of the group, but I’m sure the coyote was assessing the entire situation and responding to humans too.